With the new Clifton Baumatic Perpetual Calendar Baume & Mercier for the first time combines its new high-performance Baumatic movement (Baumatic BM13-1975AC-1) with a perpetual calendar. In addition to five-day power reserve, the 42mm gold-cased Clifton Baumatic Perpetual Calendar offers a precision of –4/+6 seconds per day throughout its power reserve period. As with all new Baume & Mercier watches sporting the Baumatic movement, the new watch can also resist magnetic fields of up to 1,500 gauss and will require no maintenance for at least five years. The new watch offers the range of displays and functions you’d expect from a classic Swiss perpetual calendar, but shows them on a particularly un-cluttered (and sapphire-domed) dial. These indications include: date, the day of the week, the month and the phases of the moon (while automatically taking into account the variable lengths of months and the leap year cycle). Three counters are reserved to the perpetual calendar: the first at 9 o’clock for the day of the week, the second at 12 o’clock for the month and leap year cycle, and the third at 3 o’clock for the perpetual calendar. 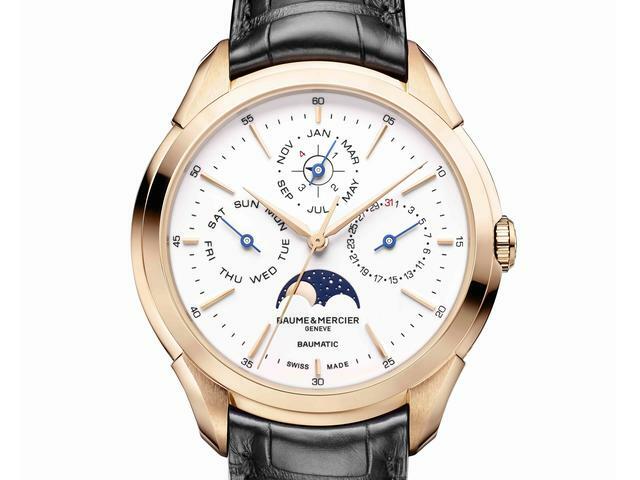 To make reading the dial even simpler, Baume & Mercier has blued the hands for the calendar functions. 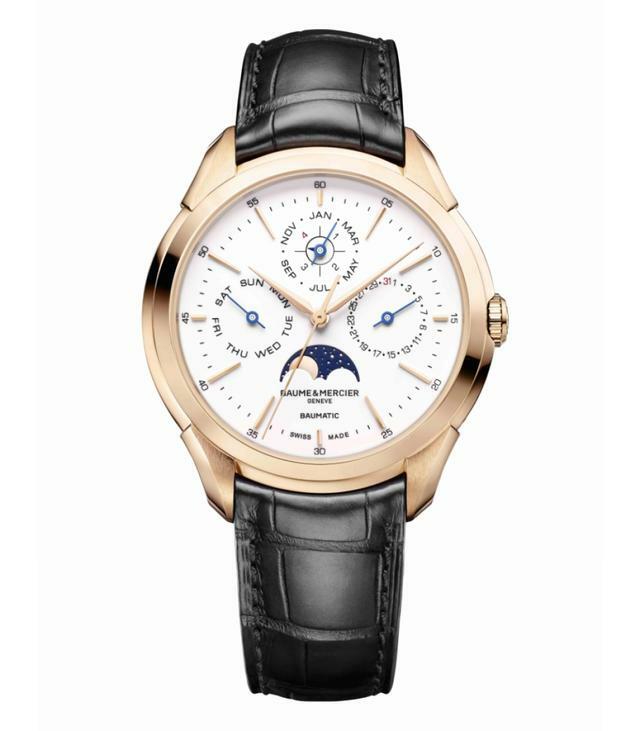 Also, the Clifton Baumatic Perpetual Calendar requires no date correction before March 1st, 2100, a non-leap year. The new watch continues Baume & Mercier’s tradition of launching at least one complicated model to complement its deeper selection of moderately priced sport and dress watches. In past years we’ve seen the launch of the Clifton 1830 Manual (2013), the Clifton 1892 Tourbillon Volant (2014), the Clifton Réserve de Marche 8 jours “185 years” (2015) and the Clifton Pocket Watch 5 minutes Repeater “185 years” (2015). Baume & Mercier mounts the Clifton Baumatic Perpetual Calendar on the curved lugs of a black alligator strap with a red gold buckle. This interchangeable strap may be exchanged on a whim. Price upon request. For 25 years, International Watch has been the definitive authority for all watch-related matters, providing in-depth reports on all aspects of horology, from established Swiss watchmaking firms to independent houses of horology, product reviews, technical stories, wrist trends, the unique culture of collectors, and more. There was a problem. Please try again. 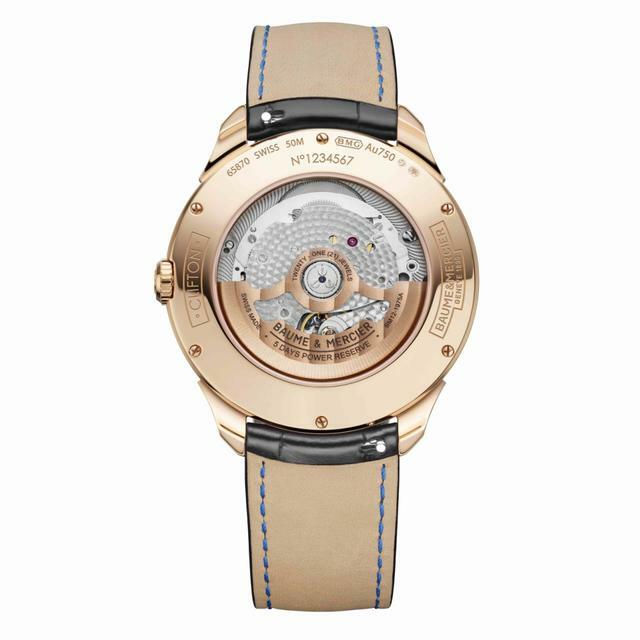 iW InsideriW Insider brings you news and new watches from new and well-known brands each week.